'Half A Million Children' Are At Risk If The U.S. Cuts Palestinian Aid: U.N. Agency : Parallels NPR spoke to the director of U.N. relief operations in the West Bank about how he makes the case for America's continued assistance in the region. A Palestinian schoolgirl protests against a funding gap at the U.N. Relief and Works Agency in Gaza City, in 2015. The Trump administration is withholding half of its planned aid to the United Nations agency that helps Palestinian refugees. The former U.S. Army officer who directs the U.N. Relief and Works Agency in the West Bank is in Washington, trying to figure out what it will take to have that money restored. Before heading to the White House, Scott Anderson spoke to NPR on Wednesday about the case he is making. The United States contributed $60 million to UNRWA this year but is withholding another $65 million for further consideration. There's confusion over the motives. Administration spokespeople say the holdup is aimed at pressuring the U.N. agency to undergo reform and at prodding other nations to increase their share of funding. President Trump's tweets, however, threatened the aid cuts as retaliation if Palestinian leaders refused to "talk peace." In the 10 years Anderson has worked with UNRWA, he says he's always looked for ways to save money in the health and education programs he runs. He's highlighting the risks of dramatic cuts by the U.S. — traditionally the agency's largest donor — at a time when a commitment to the region is needed. "What's at risk is half a million children being forced out of school. And it is schools where we teach human rights, conflict resolution and tolerance, which I think is very important in any setting globally, but particularly at this point in time in the Middle East," he says. Anderson grew up on a farm in Iowa and served in the Army, which included several tours in Afghanistan. That background comes in handy as he makes the case that aid cuts can hurt U.S. national security interests. The following are more highlights from the interview. 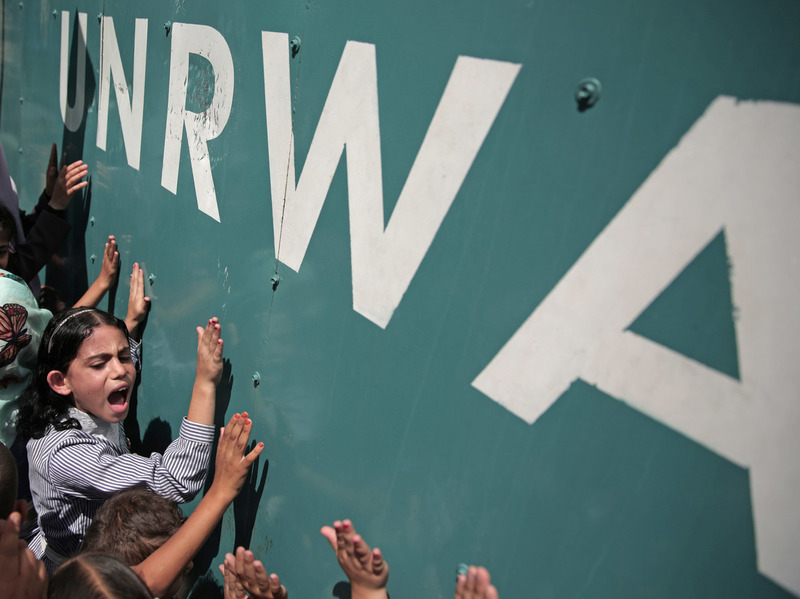 As a former Army officer, how do you make the case that the U.S. should help UNRWA? Do you argue this is a security matter? People, especially in the Department of Defense, understand the challenges that this could create. I have a lot of interaction with the Israeli army and they clearly understand what this means if UNRWA is not providing these services and it has them a bit nervous. The Trump administration is encouraging other countries to help share the burden. Is that happening? Generally governments give throughout the year and it depends on their fiscal year and when that ends. What has happened is Belgium has brought money forward, and given it earlier. Sweden has brought money forward and has given it earlier. That's very appreciated. I don't want to understate the importance of that in allowing us to continue to implement our services across the region. But, the only new money we have received thus far is $900,000 from Kuwait. Everything else was pre-planned and was brought forward. How is the threat of aid cuts viewed in the region? UNRWA is not a political organization. All I can say is from the refugees I talk to on the ground, they are frightened. Until there's a peace deal [between Israel and the Palestinians], UNRWA is part of the social fabric that exists. Don't you worry about a dependence on aid? The most important thing we do is education, by far. That's because you are preparing people for the future. That's not dependence, its creating an opportunity for them to be independent. One of the families I visited captured it eloquently. They said "refugees don't have assets, we invest in our children. And that's what the education program does. Some say an aid program is a success when it is no longer needed. How does the U.N. relief agency do that? I wish we were out of business. I wish we were no longer needed and that there was a just, durable solution, which would be a peace agreement between Palestine and Israel. Once that happens we would happily pack up and move on. I very much hope that I'm the last director in the West Bank because there is a breakthrough, there is a peace deal and the Palestinians can get on with things by themselves quite capably. Can UNRWA change how it defines refugees? Right now, there are several generations of Palestinians considered to be refugees. Derivative status or generational status of a refugee is applied the same at UNRWA as [The U.N. High Commissioner for Refugees]. So, while perhaps not as public, there are caseloads that UNCHR has where you have kind of the same two or three generations that maintain that status. There are a million Afghan refugees, for example, in Pakistan that have not been able to go back. Refugee status is conferred down until there is a solution found. Our mandate comes from the U.N. General Assembly. It is next up in 2020.